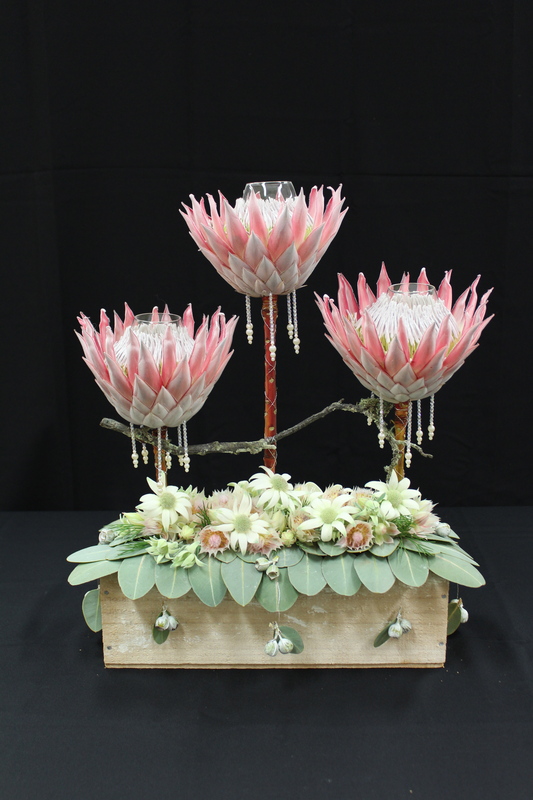 Sharon Webster based her work on a candelabra design, with three protea blooms acting as candle holders with pearls and crystals hanging down to create ‘’old world charm’. Sharon fashioned a cross bar for the candelabra from a peach branch to represent the fruit farm where the newly weds will live. 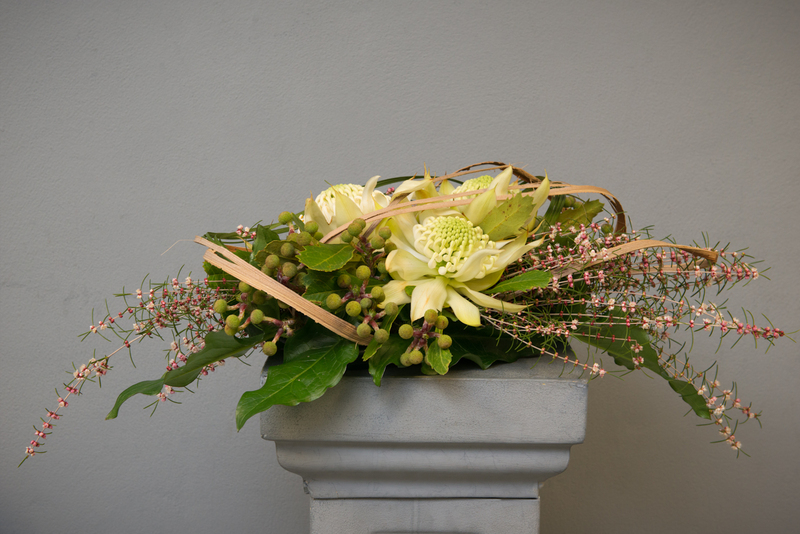 The arrangement based in an old wooden fruit box which she cut down and whitewashed. 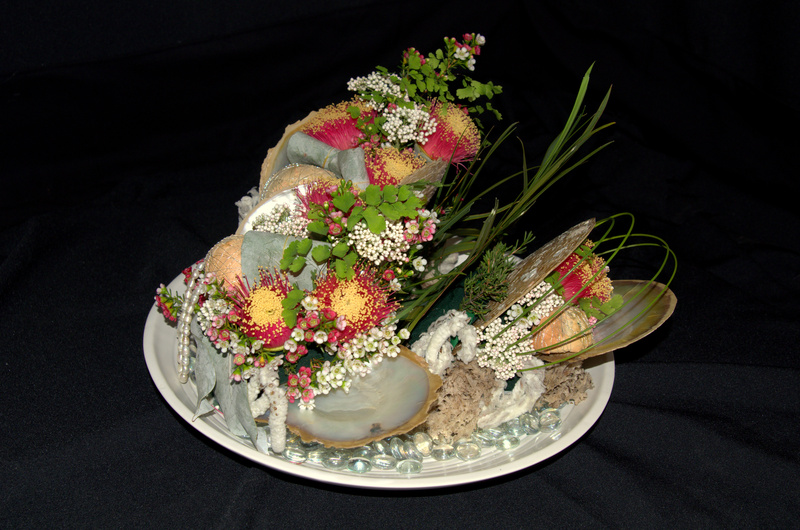 She created extra embellishments by wiring gum nuts and leaves with silver wire. 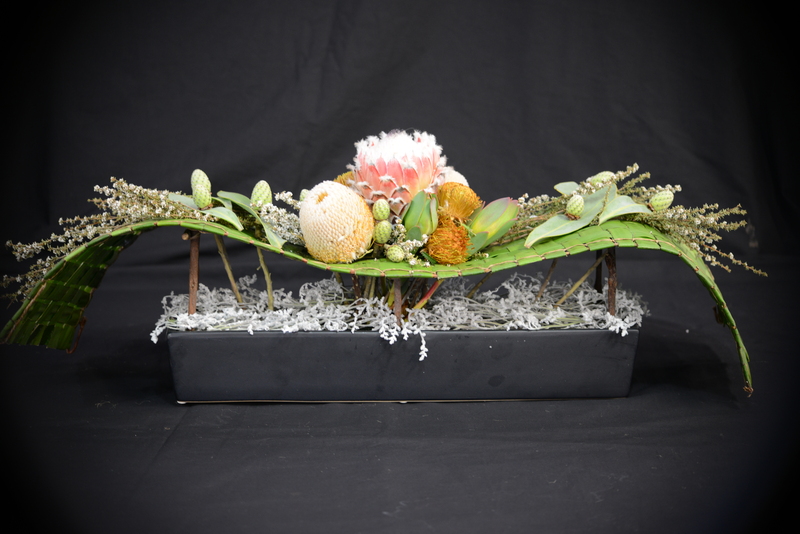 Constanza Gongora planned her design to ‘reflect the peace and calmness that we can find in the countryside (farm) and the ups and downs of the "new" life that begins after a wedding’ arranging flowers and foliages on a green mat she wove out of Gymea lily leaves. The flowers provide contrast (roughness) to the smooth texture of the woven mat and the leaves, in reference to the rough and smooth patches encountered in married life. 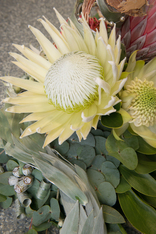 Tina Truc Nguyen used a simple white and green colour tone with a hint of pink for the wedding, using white Waratahs (Telopea), Hypocalymma (Hypocalymma angustifolium), Berzelia berry (Berzelia lanuginosa), plus foliage. 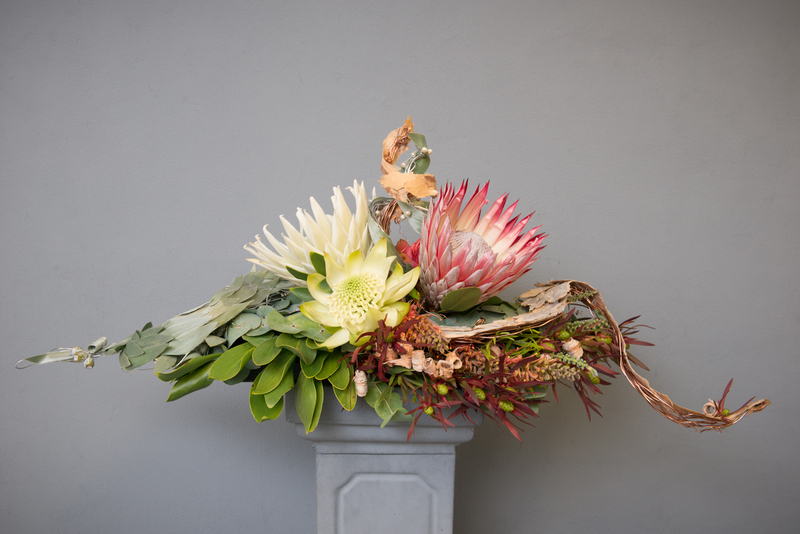 She used brown husk to add a rustic touch, harking back to the farmer’s wedding, but serving to emphasise the beauty of the main waratah flowers. Natalie Williamson created a work piece tocelebrate the themes of ‘coming together, equality, harmony, and complementary contrasts’. Her long and low table arrangement is ‘comprised of two sections, one white, silver and green, one red, pink and brown, symmetrically balanced but using different coloured materials the two sides coil around each other in the center surrounded by flowers and greenery’. This is to symbolise ‘the union between two people and the added fulfilment and joy when they come together in harmony’. She made two contrasting wire rings embellished with pearls for the centre of the piece.